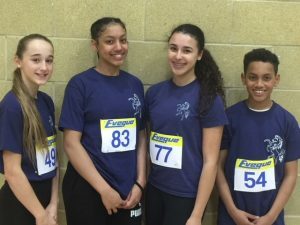 4 Bexley athletes have been selected to represent Kent at the Sportshall Regional final this year. Congratulations to Angel Gediz, Emily Frimpong and Jessie Sargeant and also Prince Gediz competing in the U13 boys. Good luck! 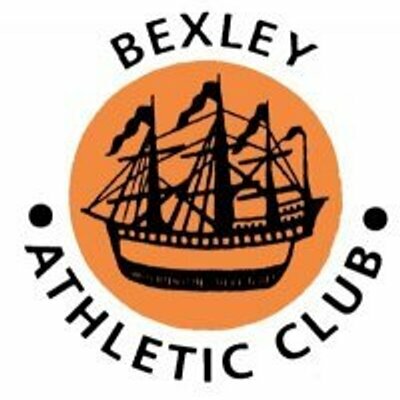 Brilliant performance from all the Kent athletes yesterday, especially our Bexley athletes who were selected. Special mentions go to our two U15 girls, Angel and Emily, who were part of the winning team and crowned U15 Girls’ team Regional Champions! They have been invited to go to the national Sportshall final in Manchester in April. Angel took extra events at the last minute and won Gold in the 4 lap race. She also came third with her team mate in the 8 lap Paarlauf. 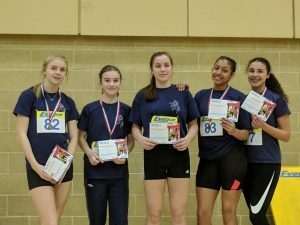 Emily won Bronze in the Vertical Jump and came second in the 4×2 relays with her other 3 Kent team mates. Well done also to our U13 girl Jessie who won a well deserved Bronze in the Speed Bounce. Jess and her partner also got 2nd place in the 8 lap Paarlauf. 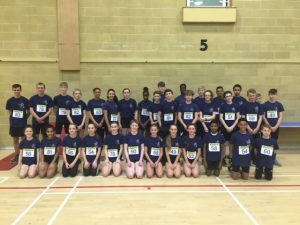 Well done also to Prince who, despite not bringing any medals home, performed brilliantly, and to all the other Kent team members who took part in the event. Lastly, thank you to all parents, coaches, officials and organisers for making the day happen.